In this video, I proposed a simple framework which helps to understand and to conduct solution conversations. 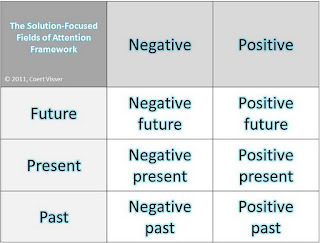 I call this framework the solution-focused fields of attention framework. This is what it looks like. 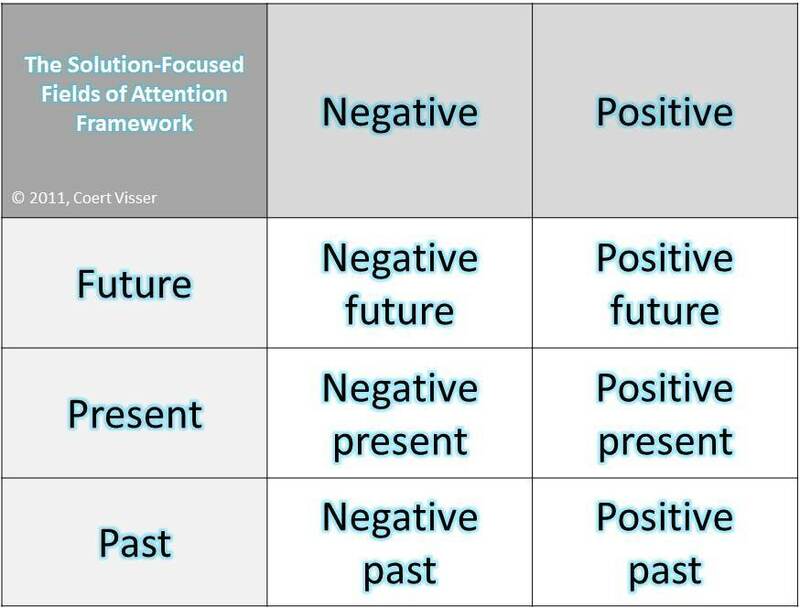 What the conversation in the video is intended to illustrate is how a process of asking solution-focused questions helps to gradually facilitate a shift from talking and thinking about negative things to thinking and talking about positive things. Solution-focused coaches do this without trying to convince the client to focus on the positive. Our approach is more subtle. We acknowledge the perspective of our clients and exercise a subtle influence by asking questions which invite clients to start define what we want to accomplish, and to describe what they have already accomplished and when they have done things in the past which worked. When clients’ attention shifts gradually from the left hand side of the framework to the right hand side several beneficial things happen. Firstly, they begin to get a clearer sense of direction once they begin to give answers to what their positive future will look like. Secondly, they begin to become more hopeful and optimistic when they begin to answer questions about their positive present and positive past. Thirdly, they start to find ideas about how they might make progress in the direction of the positive future when they explore what worked in the past and is working in the present.